Morocco, a fascinating North African country, characterized by endless ocean, deserts and refreshing, green oases as well as enormous mountain ranges and its impressive cities. 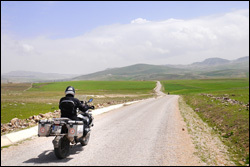 Join us on a unique motorbike tour to this exotic world of Morocco. Experience the feeling of being on the trail of an ancient secret, a life long before our time. 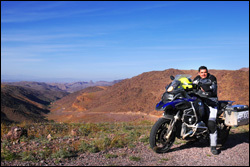 This is one of the best motorcycle road trips in Northern Africa. On this bike tour you will experience first hand the different facets and intersting contradictions of Morocco. Far away from the beaten track you will be on the road, where the country is still authentic and realize the dream to ride the african continent on motorcycle. Along the roads of the Rif mountains, you reach the old imperial city of Fez, which is, with its massive walls and mighty gates, one of the largest medieval cities in the world that is still inhabited. From here you start the first mountain stages and cross the Middle Atlas with its thousand-year-old cedar forests and then the High Atlas, where still today Berbers, the natives of Morocco, live as nomads. You will reach the oases at the largest sand desert of Morocco, the Erg Chebbi, where you linger for a day and discover the secrets of the desert. 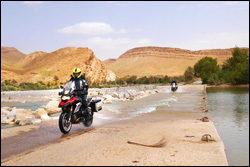 On unforgettable motorcyclke tracks you admire the natural spectacle of the Gorges of Todra and Dades in the South of the High Atlas and continue the road via Ouarzazate to the caravan check point of Ait Benhaddou, whose entire center has been recognized by Unesco as a World Heritage Site. 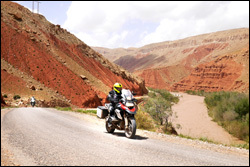 The crossing of the High Atlas to Marrakech is one of the most beautiful rides in the life of a motorcyclist. The single-track and very winding road leads through scenic and touristy little developed areas. The Mount Toubkal, the highest peak in North Africa, awaits you here with a fascinating panorama. There is no better way to discover this area than on motorbike ! 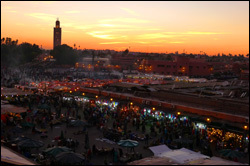 You reach Marrakesh, former capital and famous for its markets and festivals. The lively beating heart of the city is the large square Djemaa el-Fna in the old town. To the north you cross the Moroccan hills and reach the Atlantic coast, where Casablanca and Rabat are, and you leave the African continent over the port of Tangiers. This trip offers complete motorcycle touring pleasure on small, winding mountain roads with stunningly beautiful scenery. The roads throughout the entire route are asphalted. Off-road detours are possible on request and according to riding ability. The comfort of a 3* to 5* hotel awaits us after negotiating the mountain and desert stages of the tour. We just came back of the Marokko tour. It was a wonderful experience, the roads, the landscape in one word fantastic! Also the team the organisation very professional. Thanks very much for the nice bike holiday. 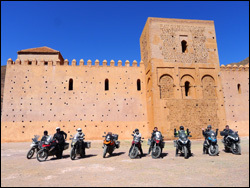 Last Feb I rode the Moroccan tour with Hispania Tours. Everything was perfect and it's on my top 5 greatest trips list. The entire Hispania Tours team works 110% for the client's benefit. This tour is perfect for US riders looking for a winter destination. The culture, scenery, roads, climate and guides can't be beat. You can even challange Jesus to some motorcycle "Trivia" but you'll never win! I often think about doing it all again, especially since I need to get another bottle of "Berber Viagra". Arrival at the airport Malaga and transfer to the hotel. During the opening dinner you will meet all participants and discuss the tour. Your motorcycle tour to Morocco starts on the coastal road from Malaga to Tarifa, from where you take the ferry to Africa and reach the legendary port of Tangier through the Straits of Gibraltar. Beautiful motorcycle routes await you in the Rif mountains in the North of the country and you enjoy the fullest the first impressions of your trip in the blue city of Chefchaouen, where you spend the night. The fields in the plains around the ancient imperial and university town of Fez are surprisingly green and fertile. At the Laou river you pass the check point of the former Franco-Spanish colonial border and later you cross the Oued Sebou, the biggest river in North-western Morocco. Once you have arrived at the old town of Fez, you will quickly realize why this place over centuries was a hub for most caravans from all over Africa. With the Middle and High Atlas, two mighty mountain ranges are waiting to be crossed in one single day from North to South. The Atlas is a natural climate border in Morocco. On its northern flanks the moistly air of the Atlantic is humid and on its southern side the desert begins. You will exceed the altitude of 2000 meters twice that day and go through the entire spectrum of vegetation of the country. The thousand-year-old cedar woods of the mountains and the following high lands are unique and stunning. Berber nomads are drifting by with their animals as the the sights in the distance make the dimensions of this continent surprisingly clear. There is nothing better than to be here on you motorcycle. 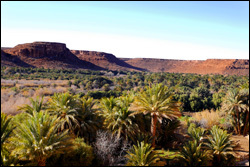 The Gorge of the Ziz river leads you out of the mountains into the Tafilalet, the southernmost group of several palm oases in the Moroccan Sahara. Here you are staying at an oasis after a unique driving day. Palm groves as far as the eye can see. At its centre lies the former commercial and university town of Sidjilmasa, the present-day Rissani, which was located on the caravan route Niger - Fès - Tanger. The air becomes increasingly drier and little tongues of sand on the asphalt are harbingers of the nearby desert. 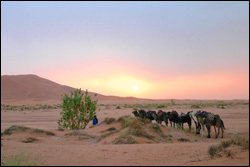 The sand dunes of Erg Chebbi, one hour from Rissani, are 22 km long and 5 km wide. 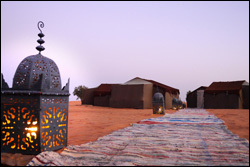 Here, at the south-western point of your tour, the starry sky of the desert night will remain a life long memory. After the rest day on the edge of the desert, you have charged enough energy to start one of the queen´s stages of this tour, as the road returns back to the mountains. Far away from the main roads you discover fertile Atlas valleys, which reveal with their originality the simple lifestyle of the Berbers. Anywhere else you will experience Morocco as authentic as here. Also today you climb over the 2000 meter mark and with the Todra Gorge an absolute highlight is waiting at the end of the day. 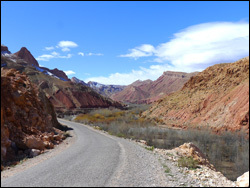 The red rock formations of the Dades Gorge rise like long fingers out of the ground. You drive 60 km deep into the canyon, also here the Berber farm every patch of land on the edge of the Dades river. You have morning coffee at the narrowest point of the Gorge, where you enjoy the stunning views of the Dades breakthrough. The kasbah trail continues westward. Ancient clay castles along the road are the witnesses of the history of the caravans on the southern side of the Atlas. Today the film industry uses the oriental flair and the clear light of the area. Many forgotten movie sets are located near the film studios of Ouarzazate. Although Marrakesh is already quite near, you decide to stay a few more days here in the mild south. The Souss Valley separates the two mountain ranges of the Anti Atlas and High Atlas. The breeze of the Atlantic is sometimes already in the air. The longest and most humid river of the country leads you along orchards to the town of Taroudant. This city is often called little sister of Marrakesh, because both the city walls and also the old town, called Medina, are very similar to the ones of Marrakesh. The very dry Anti Atlas Mountains are very different from the two other Atlas chains of Morocco, the transition to the desert is almost fluent. Here agriculture was possible also in the past only with great effort and with very low yields and so the inhabitants lived as semi-nomads. Abandoned terrace fields and threshing places are still visible in many places. You ride through nearly deserted, but extremely impressive landscapes, which are rarely interrupted by more fertile valleys. Marrakesh is a daily´s ride away from Taroudant. 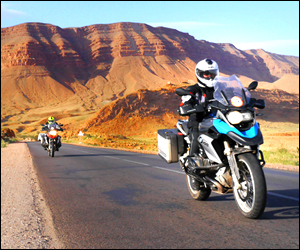 The crossing of the High Atlas on this day is to be included to the most beautiful experiences in a bikers life! The single lane brings you on a very winding route through scenic and touristy little developed areas. You arrive at Tinmal mosque, the origin of the Almohad empire in the 12 century as you lay your eyes on the summit of Mount Toubkal, the highest mountain in North Africa with 4,167 metres. Your Atlas experience is crowned by sheer riding pleasure along the entire 230 kilometers long journey, which ends at Marrakesh, the Pearl of the South. 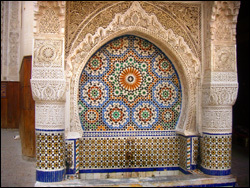 Due to the large number of architecturally significant buildings, including the Koutoubia mosque built in 1162, the Kasbah from the 12th century and the Ben-Jusuf school from the 14th century, the old part of the city was declared together with the Agdal gardens and the Menara gardens UNESCO world cultural heritage site in 1985. The city‘s main attraction is the Djemaa el Fna (lit. : square of the decapitated), the world famous medieval market, today a lively place of oriental story tellers, snake charmers and jugglers. The Jardin Majorelle, which impresses with its peculiar architecture and plant diversity is located in the new town. You soon realise, that it is always best to make easy resting at one of the countless coffee shops inside the Medina and watch the hustle and bustle pass by. The call to prayer of the Muezin by sunset on the Fna square should not be missed anyway. Marrakesh appears only in the rearview mirror, today you ride North. 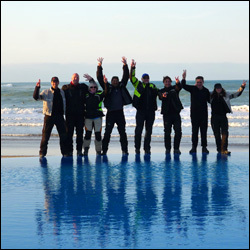 The road brings you to the long coastline of the Atlantic Ocean where the domain of Casablanca and Rabat is noticeable. 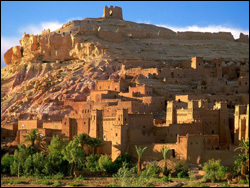 Until you get there, you will enjoy the winding roads of the fertile countryside of Morocco. Early in the morning at sunrise over the sea you start towards Rabat, the capital of Morocco, and visit it´s iconic Hassan tower. From here you speed up to the border of Tangier, where the ferry to Europe is waiting and your Morocco adventure slowly comes to an end. Testride the Moto Energizer functional underwear by X-BIONIC on this tour!